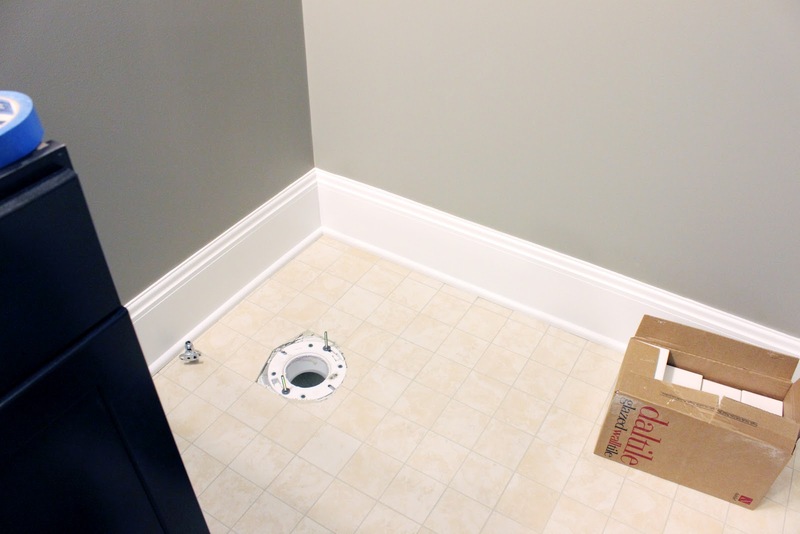 Since we were good to work on the floor tile, I mentioned earlier that we installed the toilet. 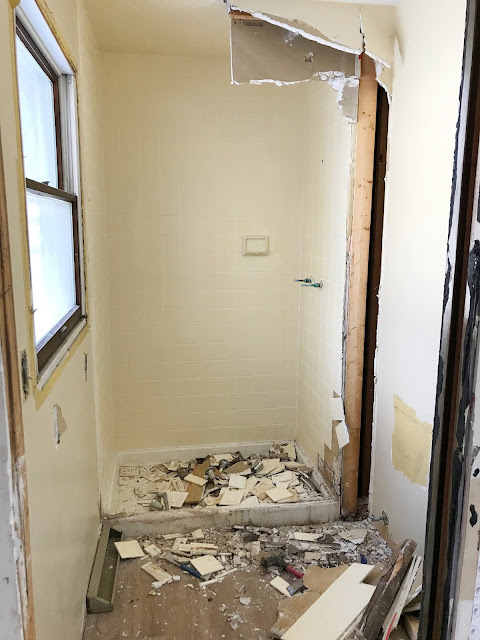 The actual placing of the toilet went really quickly, but the prep was a lot more work. 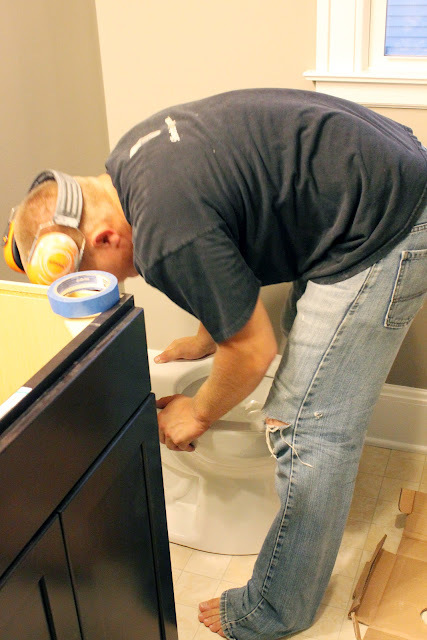 To help make it easier on both Mike and I, we installed and painted all the trim around and behind the toilet. 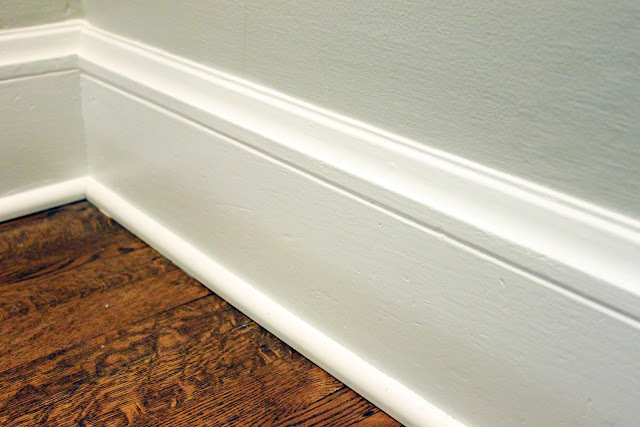 We have awesome original trim and baseboards throughout our house. It pretty much sold the home to us when we saw it. So, it was important to Mike and I that we match the trim in the bathroom, not only to tie it into the rest of the house, but also because it adds so much character to our spaces. Mike's no stranger to adding new trim in our house, and he's even had to piece new trim next to the old stuff when he built our window seat two years ago. Luckily it's a pretty easy to find trim profile that matches the detail on the top of the base boards and from there its easy to piece together the rest. We made the same profile by adding this moulding on top of a 3/4" piece of plywood, (it's painted so we saved money by not using solid wood), cut 6" high, and the length of the wall section. We then added some quarter round along the floor to finish it. 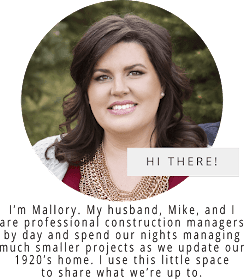 We really lucked out that all the elements can easily, (and fairly cheaply), be picked up at Home Depot, although we totally would have bought the router bit if it was necessary, we love our base boards that much. Mike lets me prime all the pieces before he installs, then he fills all the holes, and I go back and paint a couple coats of semi-gloss. So, all that work just to install the toilet - but it's worth it. Because, clean or dirty, I do not want to have to stick my head in any toilet just to paint some baseboards. But, back to the toilet. We went with an elongated bowl, (because apparantly to guys this is very important), and chose a low-flow model from Carter Lumber. 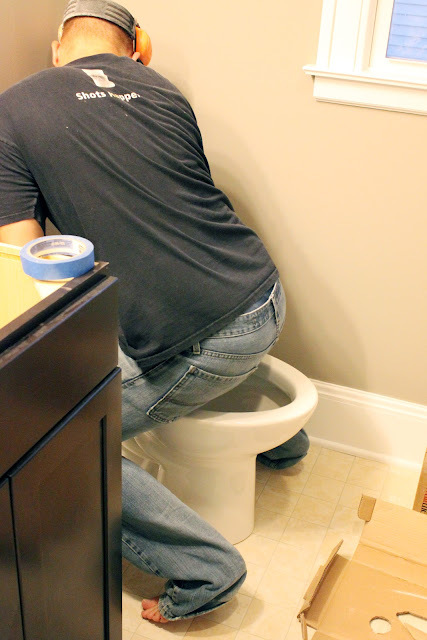 There's a million tutorials on the internet to install a toilet so I'm not going to go into detail. But, it was basically Mike putting the wax ring on the toilet and adding some sealant around the edges. 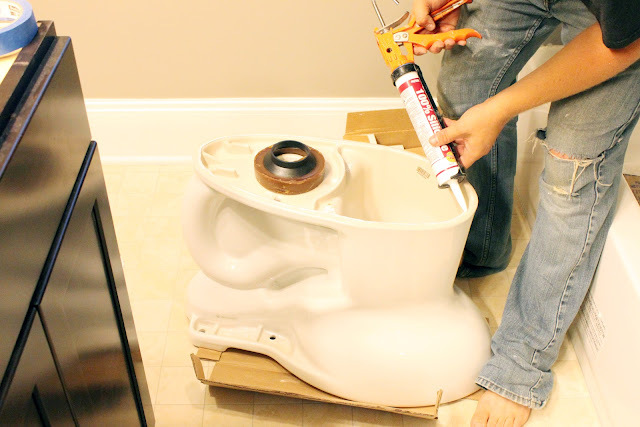 Then, flip over the toilet and carefully, (with the help of your eagle-eyed girlfriend), line up the wax ring and bolts. Straddle toilet to ensure a good seal. Seriously that's a real step. How else are you going to know that if you sit on it, it's not going to wobble and fall over? Hook up the water line, and lastly, step back and admire the throne. 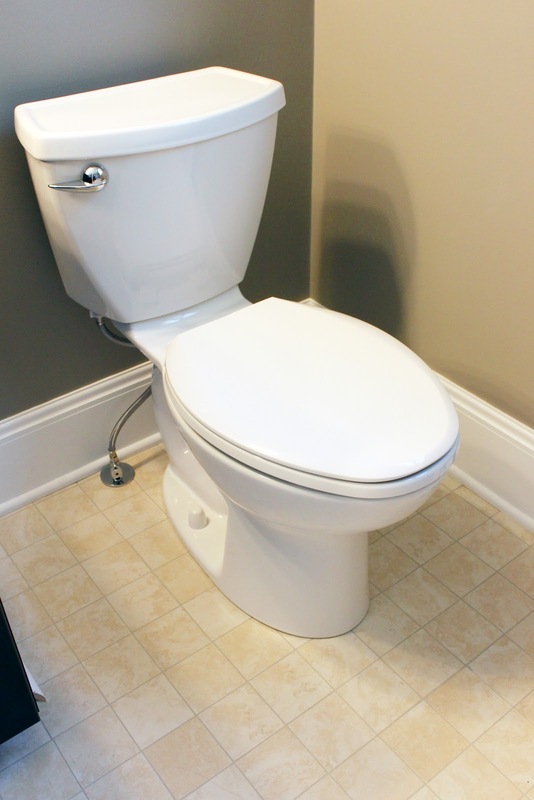 The toilet itself is a little longer and taller, but the space on each side is the biggest difference. I remember planning the vanity and talking about a couple inches here and there. In the end we went with the smaller vanity adding the most extra space for the toilet. I wouldn't give back any of the 10 inches we gained doing this. It's so nice! 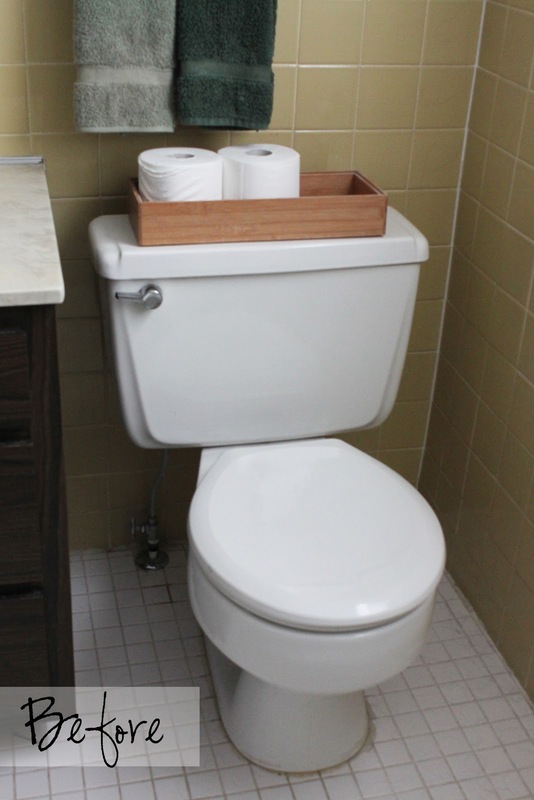 We offset the toilet a little bit to the right, (closer to the exterior wall), so that we can add the toilet paper holder to the side of the cabinet and still have the same amount of space on each side. Next time I'll be back to explain how we installed the solid surface countertops all by ourselves! I'm really considering using 3/4" plywood for the basboards in our home since we are going with the "white trim" look as well. My only advice to you for the future, is to not put sealant on the bottom of the toilet. If your wax ring does not set just right, you could have water seepage later on and not know until you notice a smell. It might not be "as" bad if you have solid tile beneath your bowl, but if you have wooden flooring of any kind (laminate included) and you get a leak, you'll never know until it's too late and your wood flooring and subflooring need to be replaced. Great point Trey! 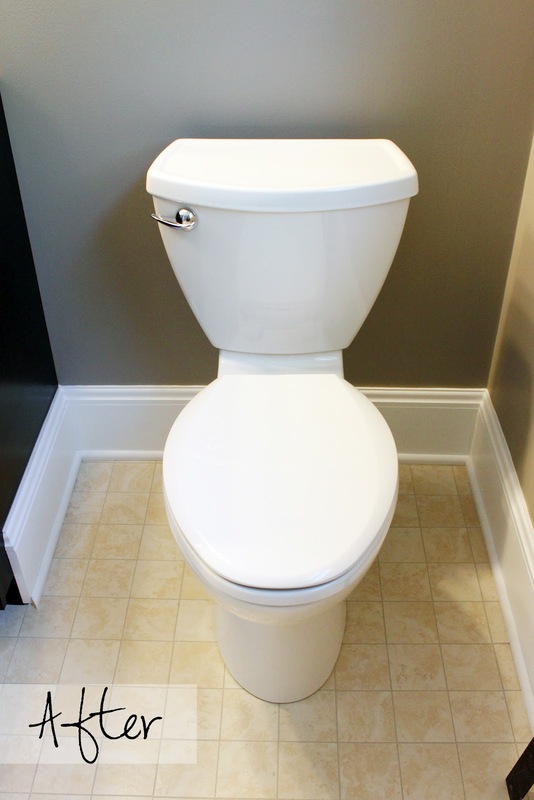 There's different schools of thought on adding sealant when installing a toilet. We chose to add sealant because we didn't want any water from the shower or cleaning products to get under the seal and sit stagnant. There is the case for not using sealant to allow a potential leak to flow out, notifying someone that there's a problem. Unfortunately, if your floor is pretty level, and the leak is not that big, the water could still sit under the toilet and case issues. My suggestion for those that want to add sealant (to prevent water from getting under the toilet) but worry about potential leaks, you could leave a gap of sealant in the back so allow water to escape should a problem arise. Thanks for bringing up the argument for the other side though! On a different note, we love our baseboards and it's one of the things people notice about our house! We found using plywood saved us a lot of money since we were painting everything white anyways!